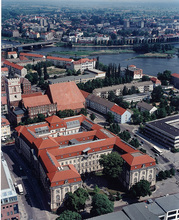 The European University Viadrina was founded in 1991, continuing the distinguished tradition of the first State University of Brandenburg (Alma Mater Viadrina, 1506-1811). Due to its unique geography and history the Viadrina plays an important role as a bridge between Eastern and Western Europe. It is the University’s aim to attract a diverse and international faculty and student body, to support research and teaching on European and global issues, and to establish academic relationships with many different countries and regions. The Viadrina’s special attraction is the opportunity it offers to study together with fellow students from Poland as well as other European nations and the rest of the world. Small classes, modern facilities and a renowned professorial body provide a distinctive and distinguished learning environment for undergraduates and graduate students in many scholarly and professional fields, including economics, law, the social sciences and the humanities. Frankfurt (Oder) lies in the heart of Europe on the river Oder and directly on the border with Poland, and about one hour away from the German capital Berlin. Frankfurt (Oder) has a population of approximately 62,000. The famous poet Heinrich von Kleist was born in Frankfurt (Oder) in 1777 and also attended the town’s university. Frankfurt paid tribute to her famous son by dedicating numerous buildings and parks to him (e.g. Kleist Museum, Kleist Forum and Kleistpark). Historical buildings, such as the Town Hall and St. Mary’s church, display Frankfurt’s past as a powerful and rich trading town and as a member of the Hanseatic League. The lively Polish neighboring town of Słubice is within ten minutes walking distance from the university. Berlin can be reached within one hour by train. Frankfurt is a green town beautifully located by the river with a promenade, parks and an attractive surrounding countryside. There are renowned cultural venues such as the Kleist Theatre, a cabaret, the State Philharmonic Orchestra, sports facilities and lively student bars and clubs.